This season the Peron’s Tree Frogs were spawning in my water pots as soon as the days warmed and lengthened in Spring. The pots are teaming with tadpoles and I find that I need to supplement the food supply with boiled lettuce and the occasional Spirulina Algae Tablet. 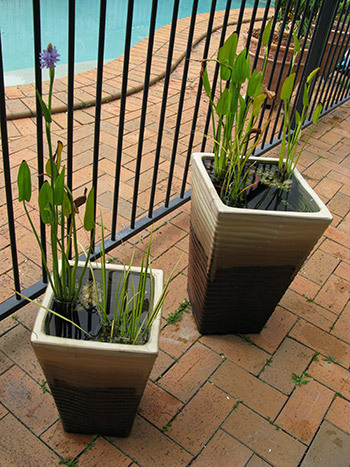 I have 2 pots and a half wine barrel with assorted water plants – reeds, waterlily and pebbles. The water in the smaller pot will over heat in extreme temperatures and unfortunately the inhabitants tend to die. 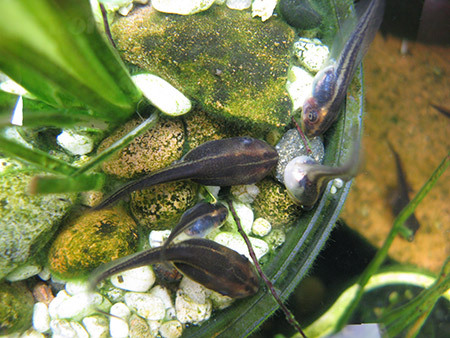 The tadpoles are now sprouting back legs and have a voracious appetitie! Hi Sue I love your pet frog tanks, how did the Dainty eggs go? I would love to see some updated phoos! What sort of filter did you use & are your tanks heated or do you use a UV light? Love your creativity. I run a cheap little sponge filter in the tank to help clean up the water and circulate it. A small water heater keeps the tank at tropical temperatures. During summer it doesn’t operate much but in winter the thermostat is switching it on. Yes I use a UV light – one recommended for frogs. I change the globes (recommended) once a year as they do wear out. Thanks for your kind words. Unfortunately some of that creativity does not translate into easy cleaning and maintenance.